For Johnna McDonald Kredel, her business idea was inspired by the family pup she rescued. Herbie, a black lab and whippet mix, loved fresh baked treats back when she and her family adopted him in 2008. That’s when she says her passion for making treats, as well as the growing demand for the “perfect recipe,” encouraged her to open her own business in December 2013. Today, McDonald Kredel is the owner of Nom Nom Nom, a local maker of all-natural, preservative-free dog treats. “We are an Ohio Proud company and source most of our ingredients from local farmers, growers, and producers,” she adds. All of the treats from Nom Nom Nom are baked fresh for each event and every online order. Most recently, the shop has added birthday cakes, pup cakes, ice cream, and cookies. 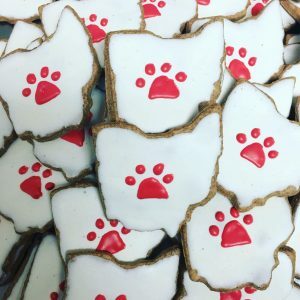 That freshness and drive to create healthy treats for your fur babies led to McDonald Kredel opening the first brick-and-mortar location of Nom Nom Nom in downtown Canal Winchester. McDonald Kredel says that what makes Nom Nom Nom unique is that it is a one-of-a-kind business. 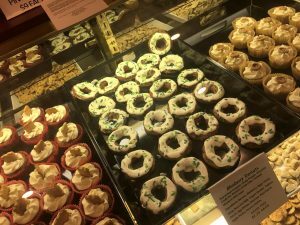 “We are locally owned and make our treats with locally-sourced ingredients,” she says. As for the future of Nom Nom Nom, it’s looking busy and bright. McDonald Kredel says she hopes to add Doggie Donut Saturdays in the next month or so, and also partnering with a local wine bar for some fun events to host a string of art and paint parties. “There is event talk of a second location coming soon,” she adds. The store is located at 3 W. Waterloo Street in Canal Winchester. McDonald Kredel says there is plenty of free parking available on the street and three large, free public parking lots nearby. To learn more about Nom Nom Nom, click here. Watch video above for a sneak peek of the new Nom Nom Nom location in Canal Winchester.